I have finally felt in the mood to finish several UFO's - the Blogger's Blockapalooza quilt was an easy finish by simply stippling it on my home machine. This quilt was part of a quiltalong I participated in a few years ago using a bunch of Hushabye fabrics. Even though it's really no longer my style or taste- I am proud of it because it was a lot of work and shows that I was willing to try some new techniques. 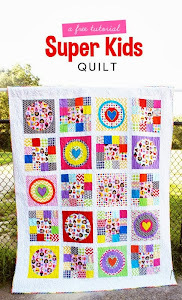 Here's another finish - an easy 5" patchwork quilt. I assembled this through strip piecing quite a while ago. When I chose the fabrics - I didn't pay enough attention to "value." In some lighting - the quilt seems washed out and overall, it's kind of uninteresting. I had also cut way too much fabrics for the top - so I ended up putting a bunch of squares down the middle of the back. This picture makes the pieced strip look off-center but it's more a function of a poor photo. (I just didn't want to wade through all of the snow in my parent's backyard!) I stippled this on a longarm. I might sound a little depressed about these two quilts - but really, I am just happy to finally have them done. Even though they are not my favorites - it's still satisfying to finish them up. It`s just beautiful.Congrats on a new less Ufo!! They are both really beautiful. You should be very proud of yourself. Great finishes both (particularly the sampler quiilt)! But I can sympathize with how you feel about these. I have a few quilt tops I made in my first year of quilting that I do not love, but other people do and, heck, I worked hard to make them! So, I am going to finish those quilts and make someone happy with them! Good for you! 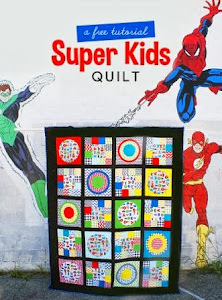 What Do You Do Wtih All of Those Quilts?